Chinese New Year will be celebrated on the 3rd of February, 2011. This year will be the year of Rabbit on the Chinese calender. Sooner or later, I should start to make rabbit theme and Chinese New Year bento, so I made this yellow ears rabbit for today's bento. The white rabbit was made of steamed rice molded with hand, decorated with egg, crab stick, nori, and jelly ball. As usual when I molded the rice by hand, I used cling wrap to shape the rice and to get the smooth surface of the rice balls. I needed a contrast for the white rabbit, so I put the fried egg rice on the bottom for the background. Inside the other box : tamagoyaki, sauteed bean sprouts, oven shoyu chicken, mini oranges, and sweetened cherry. Cute bunny, Lia. :) Love the color contrast, esp. the yellow ears, nice! I was like you before, buying the bento box without considering the size of food, but after so many bentos made, I will roughly know which one is suitable and I like 2-tiers round box, but hardly find a suitable one at my place here. And I thought you made the yellow ears on purpose :). Ehehe, I liked this way, so cute!! Gosh, I didn´t make any Christmas bento... I should hurry to make at least one bunny, before the "pupu" season goes "LOL"
Yep and in this round bento box, it looks perfect! Hi Lia, another new creation from you:) You're always so creative..the rabbit looks real cute! Love it!! @Indonesia Eats : Thanks a lot Pep! 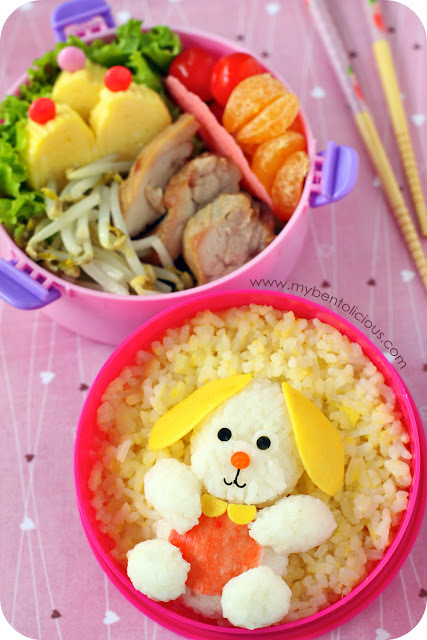 Beautiful cheerful bunny bento to celebrate the new year's sweet animal--perfect theme for us bentoists! I agree about large and deep bento boxes not working well for photography, by the way! Super cute New Year bunny! I really love it when you dish out bento tips and tricks. I'm really only at the stage of looking at how cute a bento box is. lol! But now that I have our new lunchbags, you're right, it's getting to be more about fit. Thanks for the tips Lia! Keep em coming..
@Bentobird : I believe we will see many bunnies this month from our fellow bentoist hehehe ... Have tried to photograph a deep bento box but it didn't work out well for me. Will be happy if I can find the tricks and tips from others about this :) Thanks a lot Jenn! aww.. thats a cute little cuddly bunny! like my daughter's soft toy..
oh.. thanks for sharing the advice on difficult to shoot for deep bento box. I will avoid deep boxes from now on. @noobcook : hahaha ... Thanks a lot Wiffy! I really like your rabbit ! I can barely get pb&j in a baggie let alone the work of art you put out each day. Still I love seeing what you put together. I don't follow or aspire to Bento but I love yours and have you on my favorite blogs list on my blog. Thanks for showing your creativity. @Sysyl : Thanks a lot Sysyl! Buat diet emang jangan pake box terlalu gede jade isi makanannya bisa terkontrol. Atau kalo sampai nggak Ada yg kecil, isi sayuran dan buat Lenin banyak jade karbohidratnya dikurangin tapi tetap cukup mengenyangkan. Mau posting tutorial besok, ditunggu yah!